How can non-timber forest products benefit women in particular? At BARC2018, participants heard from a number of women entrepreneurs, as well as representatives from UN Women, the Center for International Forestry Research, and the Africa Women’s Network for Sustainable Development, about these plants’ huge potential. For millions of people in the world’s tropical and subtropical belt, bamboo and rattan’s income generation potential is well-known. Fast-growing and quick to mature, bamboo and rattan have been used for millennia as a source of food, fuel, handicrafts and housing. In certain communities in South East Asia, rattan products make up 50 per cent of families’ cash income. And in 2016, almost USD 500 million-worth of woven bamboo and rattan products were exported internationally. The importance of these plants for rural poverty alleviation cannot be underestimated. At INBAR, many of our livelihoods projects have centred around women. The reason is simple. Bamboo and rattan grow locally to many households, can be legally harvested, and are easily processed in the home, without the need for investment or expensive tools. As a result of INBAR interventions, tens of thousands of women have earned their first incomes and reported an increase in social standing; several have gone on to create their own lucrative industries. 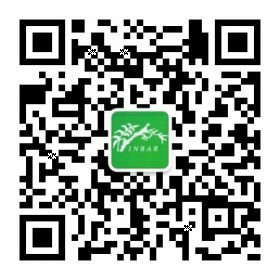 Over twenty years of work, INBAR has also met with a number of leading entrepreneurs and experts in the field. At the Global Bamboo and Rattan Congress, hosted on 25-27 June 2018, INBAR was delighted to invite some of these people to the stage, to focus on bamboo and rattan’s contribution to women’s empowerment. 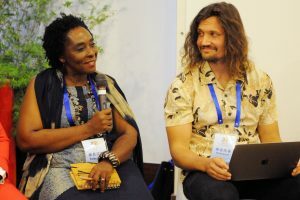 Gloria Adu, founder of Global Bamboo Products Ltd, and Markus Ilhalainen, gender researcher at the Centre of International Forestry Research (left), were two of the panel speakers in the panel. Hannah Ryder, China representative of the China Africa Advisory (right), moderated the discussion. 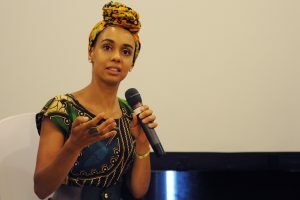 In a keynote speech, Julie Broussard, the China Programme Manager for UN Women, urged participants to think of women’s issues outside the confines of Sustainable Development Goal 5. She recounted the ways in which gender equality is relevant to all the UN Sustainable Development Goals – from climate change mitigation and poverty alleviation to more sustainable natural resource management and more beneficial nutritional decisions. To help mainstream gender considerations into sustainable development projects, Broussard showcased some relevant new ‘gender toolkits’, including a training manual produced with the Green Carbon Fund. Following Broussard’s speech, Hannah Ryder, the China representative for China Africa Advisory, moderated a discussion between a number of panelists: Gloria Asare Adu, bamboo charcoal entrepreneur and founder of Global Bamboo Products Ltd; Janette Poku Akom, the Director of Kwamoka Farms and Processing; Dancilla Mukakamari, the Rwanda National Coordinator for the Africa Women’s Network for Sustainable Development, REFADD; Markus Ihalainen, a gender coordination researcher for the Centre of International Forestry Research; and Durai Jayaraman, an INBAR staffmember and project manager for much of INBAR’s programme work. As most panelists agreed, bamboo and rattan are very suitable tools for women’s work. In Adu’s charcoal business, women are the main sales agents and distributors for products; men work mainly in the forest. Several panelists stressed the importance of women’s patience as a key factor in successful bamboo companies – a virtue which allowed them to wait for a new industry to start turning a profit, or make handicrafts. 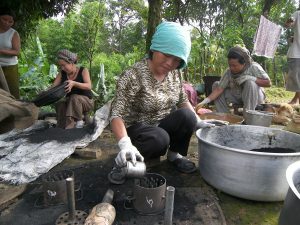 Bamboo charcoal was raised again and again as a particularly important product for women. Easy to make – requiring little more than a converted oil kiln, in some cases – bamboo charcoal burns with less smoke than traditional charcoal sources, and reduces pressure on existing forest resources. 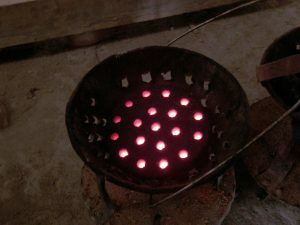 According to Mukakamari, “Charcoal is crucial for women in Africa”. Adu also stressed the huge potential for bamboo charcoal, pointing out that 70 per cent of Ghanaian forest loss came through timber charcoal production. However, there were also considerable challenges to women’s work. The three female panelists all described the sexism they have experienced in their careers. As Ihalainen pointed out, one key problem is that women have less access to decision-making and land in forest industries, and often work in lower-paid parts of the value chain, on casual labour contracts. Agroforestry was both very intensive for women’s labour, but women lacked the security that they would get to own the final product – a big disincentive to work. What kind of support do women need? Training was one key issue that was raised. Mukakamari shared the success of the China Bamboo Aid project, which provided technical support to a lot of people, including women, and Durai recounted some of INBAR’s most impactful women-focused training workshops. For Adu, meanwhile, finance was the key issue. 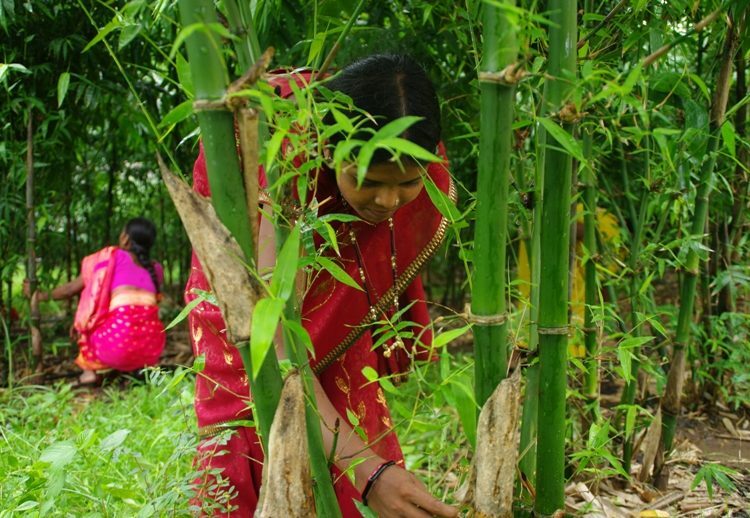 Without access to credit with low interest rates, few women can break into the bamboo sector. Durai responded with some of the lessons learned through INBAR-led projects, which were designed so that people didn’t have to invest their own capital. He also mentioned the importance of policy support to help subsidise women-run businesses. Bamboo charcoal is a particularly lucrative form of income for many women around the world, and requires little set-up equipment to make. To find out more about the China Africa Advisory, click here. Follow the UN Women’s latest work around the world here. For more news about the third day of the Global Bamboo and Rattan Congress, read here. 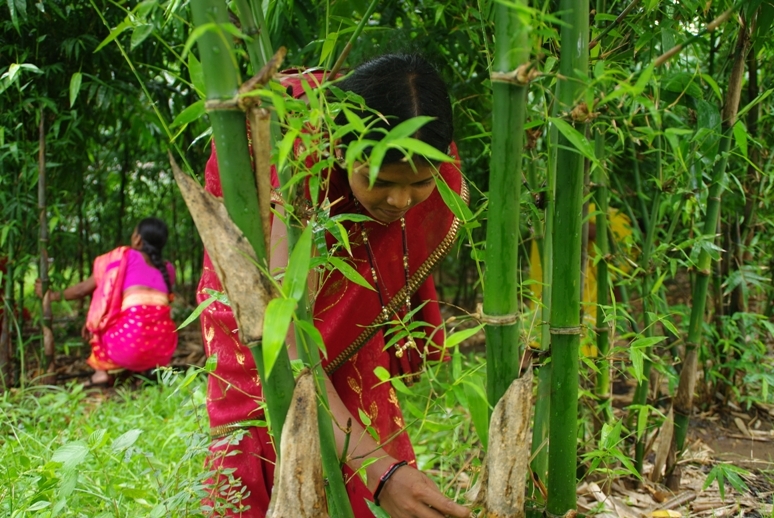 To learn more about INBAR’s work with women, follow this series on ‘Bamboo and Women’ here, or read about our bamboo incense stick project in India here.